This week was an important one for the UK’s civil nuclear sector. 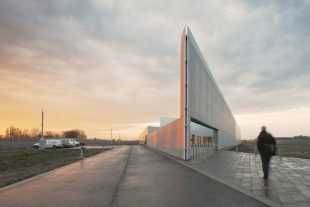 On Tuesday the new nuclear archive for the civil nuclear industry opened its doors to the public for the very first time. Funded by the Nuclear Decommissioning Authority (NDA), the Nuclear and Caithness Archive – Nucleus - is located in Wick in the north of Scotland. It will be home to over 70 years' worth of digital records, papers, photographs and plans from across the UK’s nuclear estate. A huge collection of valuable material from sites, including Sellafield and nearby Dounreay, will be catalogued, indexed and transferred to the new facility where it will be preserved for future generations and accessed by the public. 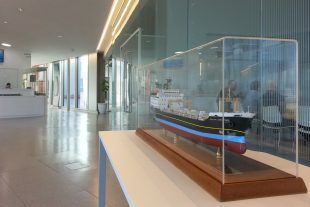 One thing visitors might not be expecting to see as they enter the main foyer of Nucleus is an impressive collection of detailed model ships. In fact the link between the nuclear industry and maritime transport is a vital one. Since its early beginnings, UK civil nuclear power has relied heavily on shipping. Shipping supports all stages of the nuclear fuel cycle from uranium mining to the products of reprocessing. As well as nuclear fuel cycle materials, a variety of other nuclear materials are shipped around the world in support of research, medicine and industry. 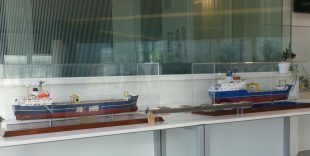 The ship models on display at Nucleus are specialist nuclear carriers and trace the history of the International Nuclear Services (INS) fleet through the years. INS is now a wholly-owned subsidiary of the Nuclear Decommissioning Authority, but our history stretches back further and is closely interconnected with the development of civil nuclear power in the UK. We began life over 40 years ago as part of British Nuclear Fuels (BNFL), and from our home port in Barrow-in-Furness we have cemented our position as world leaders in the maritime transport of specialist nuclear materials. Operating a fleet of specialist Irradiated Nuclear Fuel (INF) vessels INS, and our subsidiary Pacific Nuclear Transport Ltd (PNTL), have safely covered millions of miles shipping materials including spent fuel, vitrified high-level waste, and mixed oxide (MOX) fuel around the world. The first generation of these specialist ships were pioneers. They operated from 1979 to 2010 and the design formed the basis of the INF Code that was established by the International Maritime Organisation (IMO) in 1993, and became mandatory in January 2001. 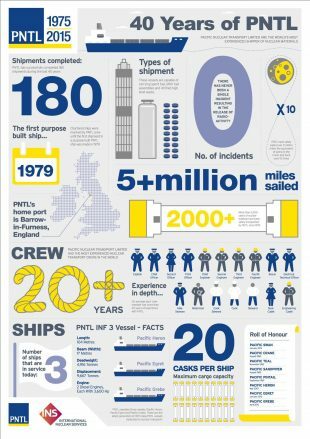 The second generation of vessels, currently in use by PNTL, adopted a design that builds on the flawless nuclear safety record and successful operation of the first generation. As well as delivering key transport projects in support of NDA’s mission, our vessels have been used to safely and securely deliver a number of high profile nuclear transports in support of intergovernmental agreements on the custody and transportation of specialist nuclear materials. Our successful history of transporting nuclear materials, coupled with a busy current transport schedule for NDA and international customers, mean that our nuclear shipping expertise is built on solid foundations. Our crews are the most experienced in the world. Most of that experience and expertise was gained on the ships you can see on display at Nucleus.